What is the secret to a long and healthy life? Part of the answer lies in the food we eat. Superfoods are one term you might have read. But what does it mean? Superfoods are nutrient dense, which means that they have a lot of nutrients, but relatively low calories. They also pack large doses of antioxidants, polyphenols, vitamins, and minerals. Eating superfoods may reduce the risk of chronic disease, and prolong life, and people who eat more of them are healthier and thinner than those who don't. 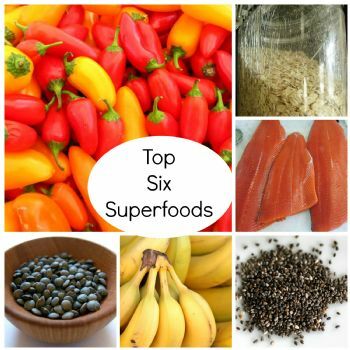 Here are six of the top super foods designed to give you energy, vitality and all around good health! Thanks for sharing! The only one of these I eat are bananas. I'm trying to have beans at least twice a week and fish twice as well even when it means making my meal separately . I forgot how much I like salmon. Bananas are always the food that people point out as high in potassium but there are many others that are much higher. A potato, sweet or regular, as potassium powerhouses. Beans, lentils, molasses, prunes, yogurt, salmon are also higher. The one really good thing about bananas though is they are easily portable. You can pack one in your purse for an on-the-go snack. I carry one in my backpack when walking home from school. And they don't need to be washed off either since they are peeled when eaten! And chickens (and other birds) love to eat the peels!